Lyndon B. Johnson National Historical Park in Johnson City, Texas, will host "Timeless Christmas at the LBJ Boyhood Home and the Johnson Settlement" on Saturday, November 27. In conjunction with Johnson City’s 21st annual “Lights Spectacular,” park rangers will provide an open house from 6-9 pm at these historic sites, whick will be all decked out for Christmas celebrations reminiscent of the 1920s and the 1860s. The LBJ Boyhood Home will be lamp lit, giving visitors an opportunity to experience family life at the Johnson's house as it was more than ninety years ago. National park rangers and volunteers will team up to portray a 1920s Christmas, complete with a cedar tree in the parlor adorned with handmade ornaments and a toy display beneath. Authentic decorations and seasonal goodies will be displayed throughout the home on December 4, 11, and 18, also. Visitors can walk the short lighted trail from the front of the visitor center or board the shuttle bus at the back gate of the LBJ Boyhood Home for a five-minute ride to the Johnson Settlement, where they’ll be guided by lantern light even further back in time to a late 1860s Christmas in frontier Texas. Further up the path is the original Sam Johnson cabin, where Lyndon Johnson's grandparents first homesteaded in 1869. Here the lighting will be provided by candles, oil lamps, and two fireplaces. Decorations are much simpler, but there are also a tree and toys. Just as strangers were welcomed in the past, visitors may partake of refreshments before they strike out again on the trail home. The Exhibit Center will be open for visitors wanting to know about life on cattle drives of long ago or learn what life was like for Lyndon Johnson's ancestors and other families who came after them and farmed this settlement land. 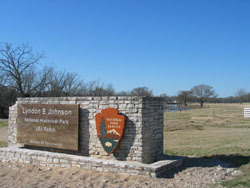 The LBJ NHP Visitor Center, located at 100 Ladybird Lane, will be open with lighted parking for visitors. The park store will offer a 15% discount on all purchases Saturday evening, November 27. ﻿﻿﻿﻿ These free park events are complemented by the stunning lighting display at the Pedernales Electric Cooperative, across the street from the LBJ Boyhood Home. Majestic live oaks are resplendent in hundreds of thousands of tiny white lights. 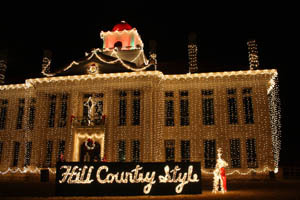 Don’t miss the Blanco County Courthouse, centerpiece of the town's seasonal "Lights Spectacular" celebration. For directions or additional information, call (830) 868-7128, extension 244.